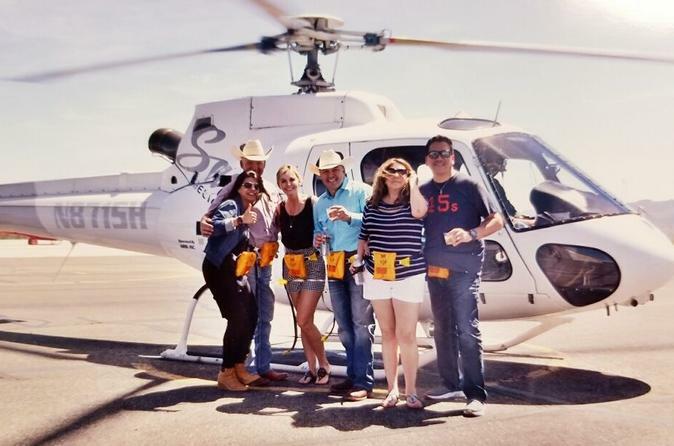 On a helicopter tour, you can see the Grand Canyon in just half a day and enjoy it with a Champagne picnic. This Grand Canyon sightseeing tour begins with a hotel pickup in Las Vegas. You'll then travel to Boulder City Municipal Airport to begin a 35-minute flight to the Grand Canyon. After boarding your helicopter, your flight passes over sites such as the famous Hoover Dam, a modern marvel of engineering, and the aqua waters and sandstone shorelines of Lake Mead. Soar along the winding path of the mighty Colorado River and into the incredible landscape of the Grand Canyon, one of the seven natural wonders of the world. 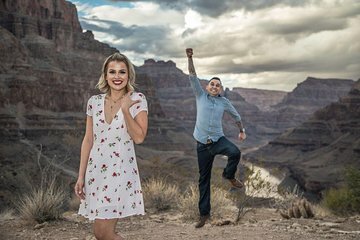 Upon reaching the Grand Canyon, hover high above this worldwide wonder, and then descend down between the canyon’s walls, over the mighty Colorado River and past geological rock formations that span millions of years. After landing at a private spot some 4,000 feet (1,219 meters) beneath the rim of the canyon, enjoy a Champagne picnic lunch. When leaving the Grand Canyon, your return flight will include panoramic views of the rugged Mojave Desert wilderness before arriving back in Boulder City. The trip concludes with a Las Vegas hotel drop-off. What an amazing experience! In addition to the outstanding views, our pilot (Christine) made the trip. Christine was the most friendly, informative, humorous and skilled pilot one could ask for. Thank you! From pickup to drop off at our hotel this experience was top notch. The entire staff was really fun and professional. We took the Sunset Helicopter/Canyon picnic tour and it was worth every penny. Christie, our very adept and personal pilot is a massive asset to your business. She was calming to the initial nerves in her "what to expect" at each different portion of the flight to the canyon. On the way back, I did not even think about it! She knew so much history and interesting info. and her music choices set the perfect scene. Take this tour! You will be 100% happy that you did. Worth EVERY penny! Well worth the extra cost to view this wonder of the world. Very humbling experience and the team that worked on the helicopter crew were extremely courteous and very knowledgeable about the history of where we went. Worth every penny spent. Mike “mad dog” was friendly and entertaining, with fabulous choice of music. I had a recent opportunity to travel for work to Vegas and I knew I had take a helicopter tour and it was amazing. I did not know what to expect but we felt safe and had the time of out lives. Its a must do when in Vegas. Heli tours aren’t cheap,but combined with the low level flight,cliff side ground rush,great sound track ,make this experience worth it! Me and my wife have a nice experience with start to end of this service. I recommend it to everyone. Easily one on the best experiences i have ever done, the company serenity helicopters are fantastic and made the day all that much better. Get yourselves booked if you are in 2 minds you will not be disappointed. 55 yrs old. Grand Canyon on bucket list. Only way to see it. Our pilot (mad dog Mike) was very knowledgeable. Would do it again.